Music isn't supposed to make sense. I'll rephrase that. The effect music has upon us is not supposed to make sense. Yet we try to understand the thing sometimes. We try to apply a kind of logic to the effect sound has upon us whilst, in the back of our minds, we know that music is a mystery, and it should really remain one. The weather report, instruction manuals, road maps; they should all make sense. Music? No. 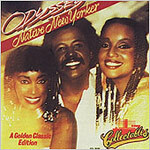 Native New Yorker, by Odyssey, is one of my favourite songs - but even the emergence, the clarification of that fact, has not taken a sensible, logical path. I'm sure I liked it when it first appeared in 1977 even though, as a dedicated Funk fanatic, the Disco explosion was not an easy transition to make. The surfeit of strings and the sprightly upbeat nature of the sound, whilst evolving quite smoothly out of Funk, required some form of adjustment. The beat was faster for starters. But more than that, the urban grits 'n' gravy, the dirty stuff from on the corner of black America, had been replaced by high rise, hedonistic glitz. R&B had gone aspirational and, as such, didn't quite tally with our council house school of cool 'street' credibility. God made some of us funky, though, and whilst pogoing served as a physical expression of - what? - rage against the state? - rejoicing in white noise? - the hustle, bump and, how shall I put it, slightly more skilled bodily engagement with rhythm, still appealed. Punk, meanwhile, did connect with the sense of frustration, anger, and alienation we might have felt as bright young things enduring the grey environment of this island in the late-70s. But now that the debris from the cultural battlefield has been cleared away we can see quite clearly the classic nature of great Disco tunes. Time has been kind to Disco, despite the ongoing revival maintained by morons who think that wearing funny wigs and wacky flares is what it's all about. Just as the skinhead 'revival' of twenty years ago rewrote the book in bastardised shorthand, so the Disco era suffers a cheap, superficial new edition. Some time during the last quarter of a century, Native New Yorker rose to join my premier division of top tunes. This 'division' is infinite, it must be said, yet there's a clear sense of what belongs with the elite in my mind. Perhaps the place it inhabits, contextually, is all-important, since it sits as track no.1 on Side Three of my K-Tel Super Bad compilation. You may laugh, but this album would definitely be amongst my 'desert island' discs. I've used it up and worn it out over the thirteen years since it's release, and it's this continual replaying which has allowed Odyssey to sneak right into my heart. The process must have been gradual. First, the familiarity, the nostalgia, the warm response to all that. Then the realisation that it sounded better than I thought it did at the time. Finally, the feeling that comes from the way our ears change over the years, the way we hear differently. It's as if those hairs which grow more profuse with age enable us to pick up vibrations more keenly. However it happened, the tune began to override what I consider to be the common sense factor, which I've discredited at the start, I know. It is not a great dance record, which eliminates the purely physical attraction. It is not an original musical conception (cross off 'artistic intrigue'). It is great song, though. But what makes a great song? The pop world is full of hooks, good, bad and ugly records have them, and they're quite capable of snagging the most reluctant listener. Native New Yorker has the formula - verse/chorus/verse etc. It also has the lyric, and the lyric, combined with the music, is the thing. When poetry meets melody, you have pop perfection. The very idea of 'a native New Yorker' grips the imagination like no other stated place of residence. Has a great pop song been written about being a Londoner, a Parisian, or a Roman? Each place has it's romantic allure, but NYC above those, has it's surroundings, the vastness of a country which gave the world the popular song in modern form. In '77, it was the epicentre of Disco, whilst the country's musical legacy of R&B, Jazz and Soul could quite naturally be incorporated, absorbed to inform the feeling of the sound. This New Yorker struts, at times; it glides, it's urban chic is infused with a touch of both street suss and Manhattanite sophistication. The saxophone sound suggests the lush whilst trying to break loose within the confines of the song. This place, so good they named it twice, we can hardly picture it without the sound of the sax, and the voice of multi-cultural America - from Broadway shows to 52nd Street bop - word and sound. New Yorker has tradition built into the lyric, along with a sense of loss - "Where did all those yesterdays go / When you still believed love could really be like a Broadway show / You were the star / When did it close?" NYC may have been the glitterball at the centre of the whole Disco phenomenon, but still, for the world-weary female native false promises and cheating hearts held sway in the romantic arena. "Love is just a passing word / It's the thought you had in a taxi cab that got left on the kerb / When he dropped you off at East 83rd". But then, "You should know the score by now, you're a native New Yorker". Like Tony Romero, king of the 'floor, the deeper urge is to find an escape somehow, to get out of the social rat trap. Without Fever's underlying social portrait of the working class road to nowhere, Native New Yorker describes the more common desperation of lost souls who are supposed to be having such a wonderful time. Despite sounding, superficially, like another celebration of all that Fun, it tells of a longing for something else - "Music plays, everyone's dancing closer and closer / Making friends and finding lovers / There you are, lost in the shadows / Searching for someone to set you free from New York City". The climatic horn riffs and exuberant shower of strings suggest the ecstasy of dance, but to follow this, they sing the line about wondering where those yesterdays went to, again. As if vainly trying to regain some pride, they follow with the reaffirmation, the reminder that says despite everything else: "You're a star / You're a native New Yorker".